The NorthMet deposit is located in the Partridge River Intrusion of the Duluth Complex, a massive geological formation near the eastern end of the Mesabi Iron Range, which contains one of the world’s largest known undeveloped accumulations of copper, nickel and platinum group metals. We are the first in Minnesota to obtain permits to mine for non-ferrous metals in the complex. NorthMet is a large disseminated sulfide deposit in heterogeneous troctolitic rocks associated with the 1.1 billion-year-old Mid-continent Rift, and is rich with copper, nickel, cobalt, platinum, palladium, gold and silver. The majority of the metals are concentrated in, or associated with, four metallic minerals: chalcopyrite, cubanite, pentlandite and pyrrhotite. 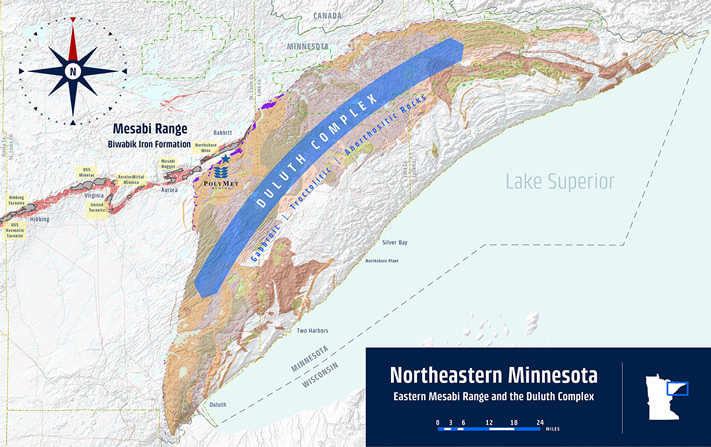 The NorthMet deposit and the bulk of the known metals in the complex are found along the northern margin of the complex in a region running about 30 miles from Hoyt Lakes, Minnesota to seven miles east of Ely, Minnesota. NorthMet is near a number of former and current iron ore mines, including the operational Cliffs Natural Resources North Shore Mine immediately north of the site.